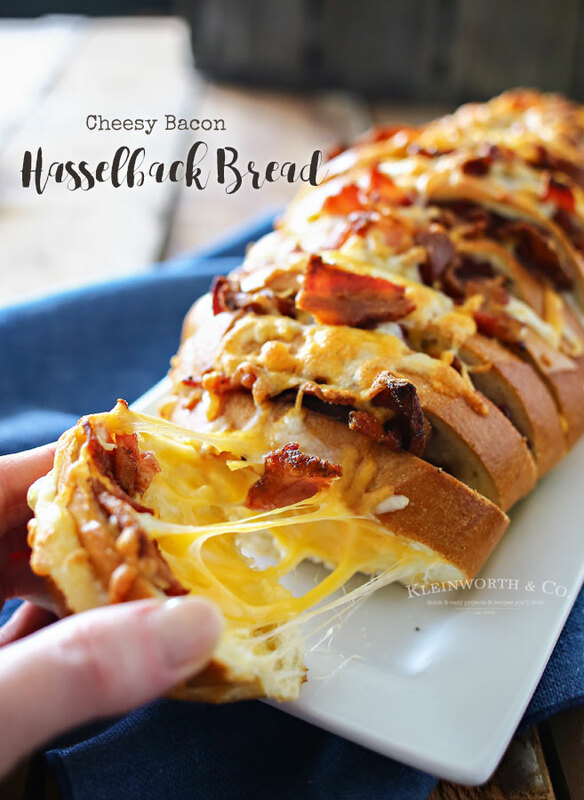 Cheesy Bacon Hasselback Bread is an easy game time appetizer recipe that the whole party will love. 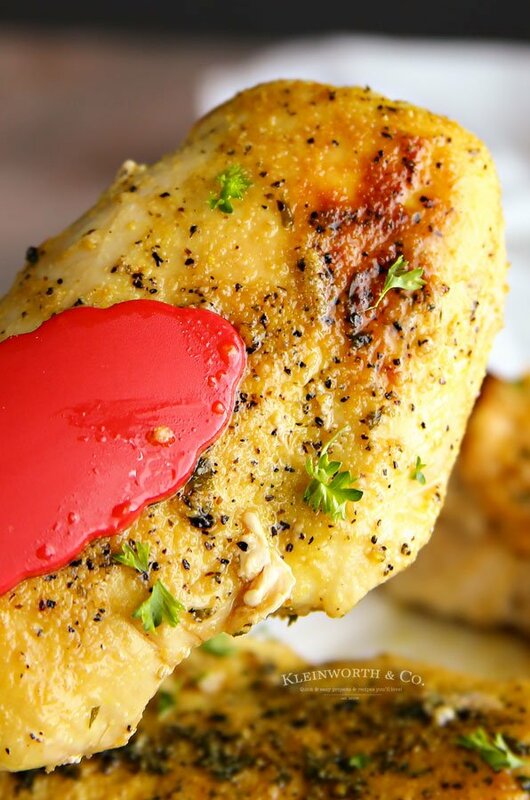 It’s the perfect snack for your tailgating party. YUM! I love appetizers & game day food. It’s an absolute must for me. 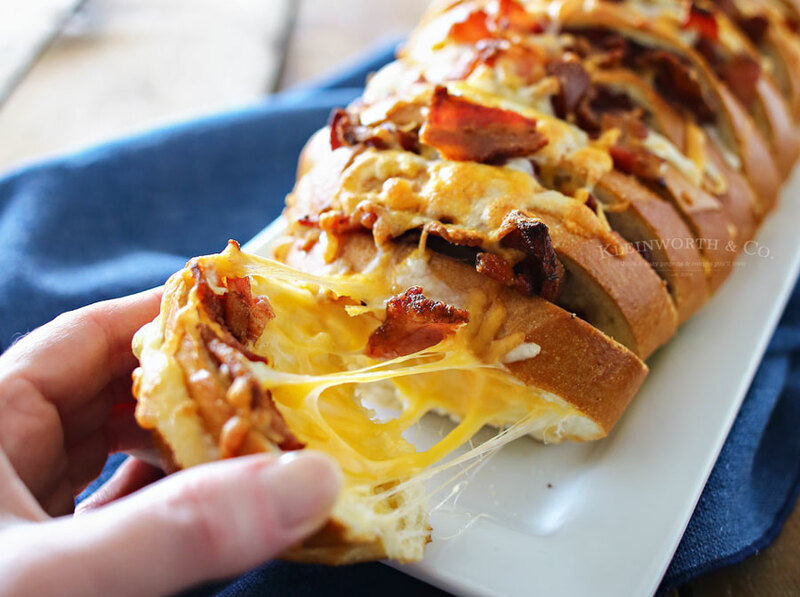 Breads, cheese, and, of course, bacon are things we enjoy often in this house. You really can’t have appetizers without including those key ingredients, don’t you think? They are essentials in my book. The whole family loves that we have games happening on Mondays, Thursdays, Saturdays & Sundays because that gives us all plenty of opportunities to get our game day snack fix each week. 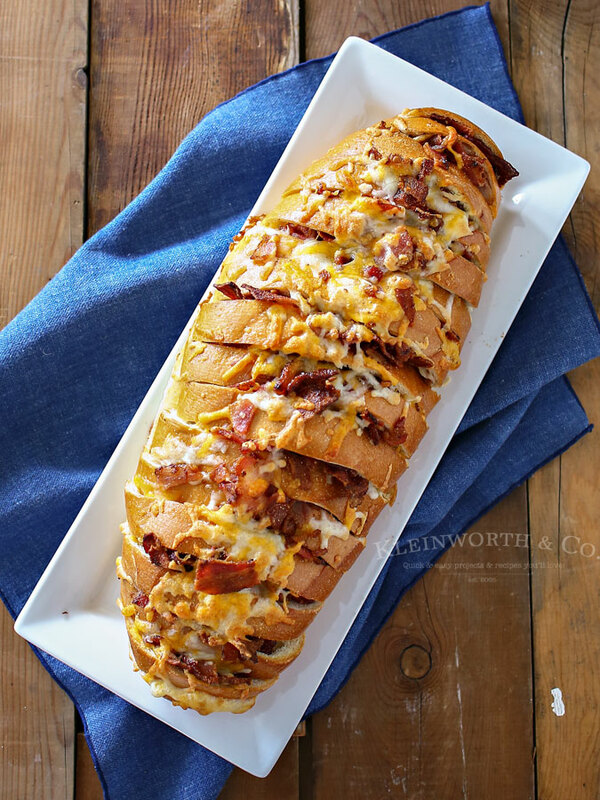 One thing we love to make is Cheesy Bacon Hasselback Bread. This is so simple to make, and it only takes a handful of ingredients. Bread, butter, cheese & bacon are key, and then we sprinkle it with a little bit of granulated garlic for added flavor. Delicious Hasselback bread only takes 10 minutes to make once you get it all prepared. I can tell you that it’s the one thing on the party table that goes the fastest in this house. 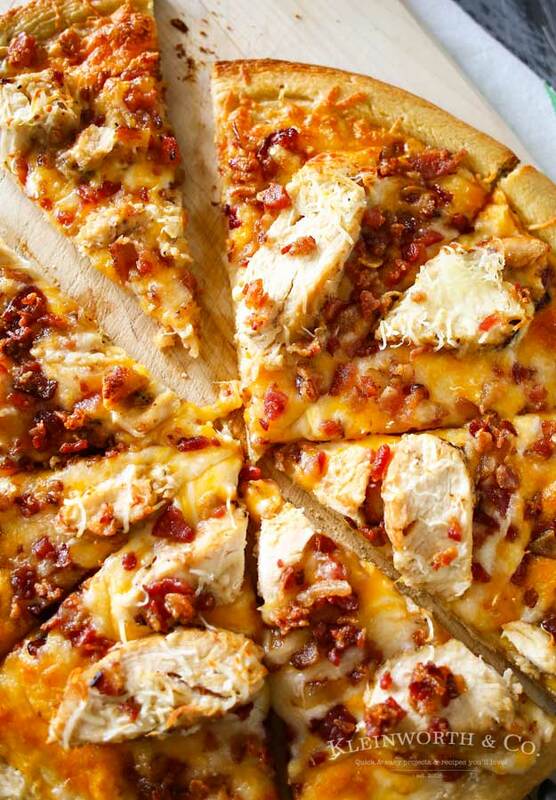 Just look at all that stringy cheese & delicious bacon!!!!! 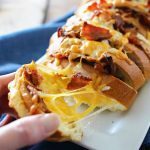 The most delicious Cheesy Bacon Hasselback Bread is an easy game time appetizer recipe that the whole party will love. YUM! Spread open each slice & brush with melted butter inside, then stuff with cheese & cooked bacon pieces. We used Wright Brand Bacon because it’s THICK & doesn’t shrink up when cooked. 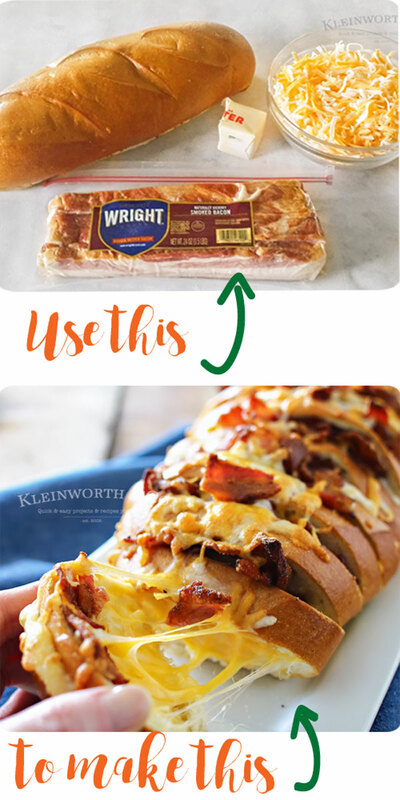 It absolutely MAKES the recipe having top-quality, thick-sliced bacon like Wright Brand Bacon for this bread. It’s naturally smoked with wood chips, which really makes the flavor top notch. The hubs (who is a self-proclaimed bacon expert) says he could even smell the difference in quality when we were preparing this bacon. Look for it in the bacon/breakfast sausage refrigerator case. I bought my bacon at my local Kroger brand store. You can choose from Hickory Smoked, Applewood Smoked, Smoked Brown Sugar Bacon, Bourbon Barrel Smoked Bacon, Oak Barrel Smoked – I want them all. Bacon The Wright Way™. And don’t forget to cast your vote for your favorite flavor! 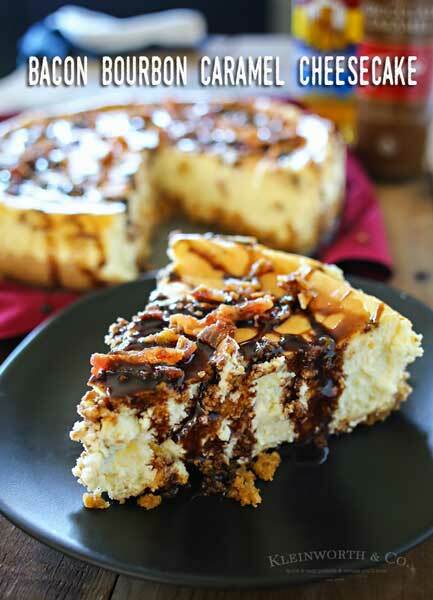 This is so simple to make & is always a party favorite! 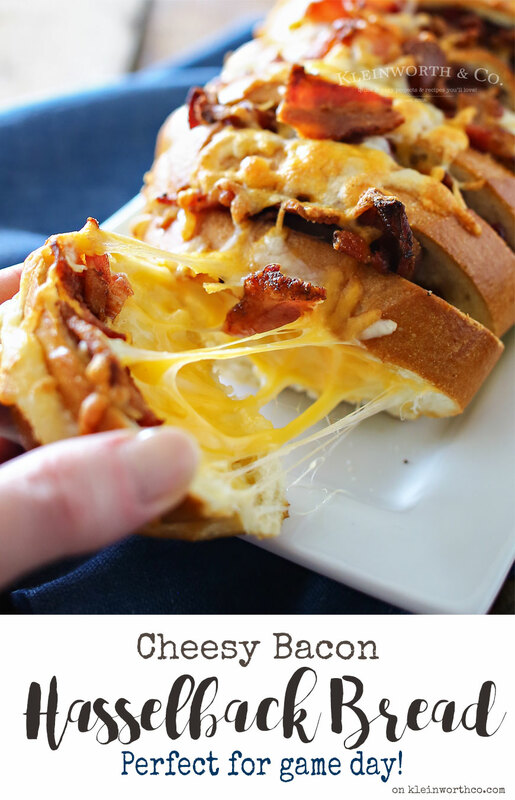 Share your favorite recipes with bacon as the main ingredient and hashtag it #VoteWrightBrandBaconLooking for more great bacon recipes for your party? 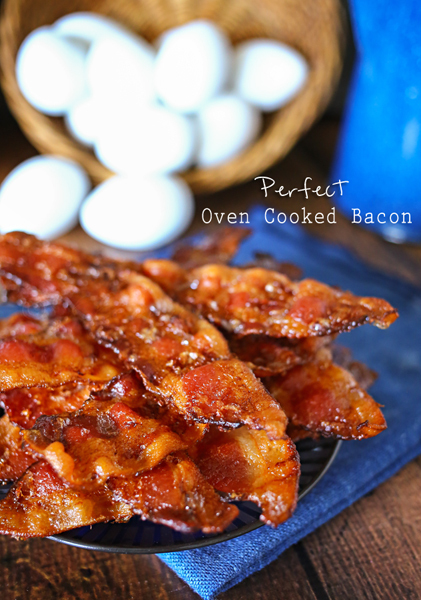 Our Perfect Oven Cooked Bacon recipe is the best way to prepare your bacon. Don’t miss these great ideas from these bloggers. I’m not sure which hasselback pizza you mean Janelle. 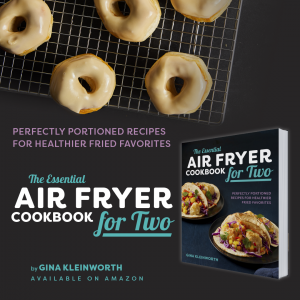 You can print the recipe for the bread above here.